Workers are planting new trees along Main Street, where in late 2012 removal of trees that once lined the street sparked controversy. Gone but perhaps not forgotten -- that's the root of an idea under consideration by Tree Board. Following removal of towering trees that lined the driveway into Longshore Club Park in January, the question was raised by some members of the last Tree Board about where that wood was going to go. Now the board, which has new members appointed by First Selectman Jim Marpe, are joining with recently named Tree Warden Bruce Lindsay to consider options for repurposing the logs. One suggestion from Lindsay is to seek ideas from a business that creates furnishings and other objects from the wood of historic and noteworthy trees. "City Bench is a company based in Higganum, Connecticut, that builds hand-crafted furniture and other art objects from revered trees," said Susan LeDonne, the board's new chairwoman. "These guys are artisans." While she stressed that discussion is in its early stages, the hope is that wood from some of those trees could not only be given to townspeople for firewood or other uses, but that some pieces could be crafted into benches or other objects. These, in turn, could be displayed in town buildings, or possibly auctioned to help raise money for the town to purchase new trees. "We still have a lot of details and we'd still like to figure out a lot of things, (but) I think it's a great idea," LeDonne said. "It's really recycling when you come down to it," she said, noting that if a tree is not particularly noteworthy it could be made available as firewood, while "where it's really an important tree, and people want in some way to remember it or memorialize it, people can have it made into something." "Although the Tree Board cannot fund the purchasing of hand-crafted furniture, it is investigating opportunities to gain funding through private donations, etcetera," she said. 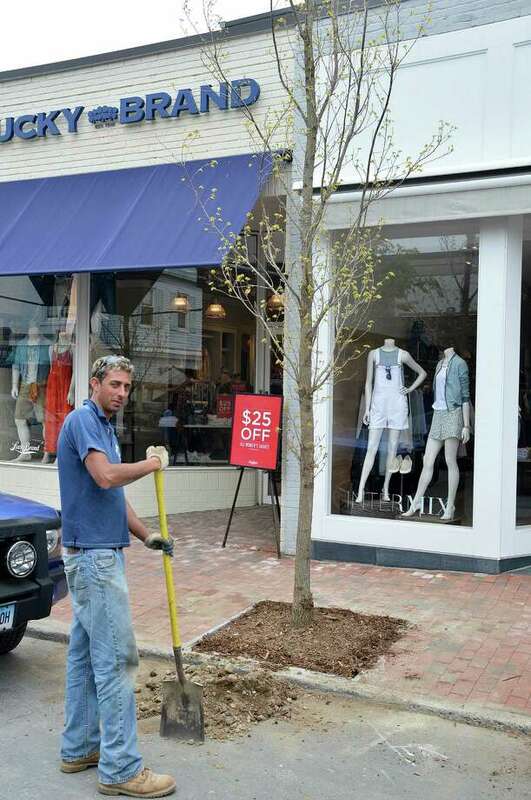 Following the removal of trees along Main Street at the end of 2012, the part-time tree warden and town came under fire. Part of the issue was the apparent failure to follow procedures by the Downtown Merchants Association in moving forward with the project. That, in turn, led the Tree Board and then-First Selectman Gordon Joseloff to seek extra funds for the Department of Public Works budget to expand the tree warden position to full time. Lindsay was named to the post last November. As the newly named Tree Board members move forward, part of their mission is to address concerns that engulfed municipal tree care -- or lack of it -- in recent years. "We have many amazing programs that the Tree Board and my office are working on," said Lindsay. "Most of them are in their infancy, though, and we don't have a lot of data to support our efforts yet." "Bruce, the new tree warden, is really on top of things," said Ed Picard, vice chairman of the Tree Board. "There's been a lot of criticism about trees that were taken down in the past," he said. "Bruce's goal is to plant 100 new trees this year," he said, and the board intends to try to help find funding to make that happen. "It's about keeping Westport green," Picard said. "He's going to do a lot of positive, good things," LeDonne said of Lindsay. "I think instead of all this negative stuff that's been going on these last few years, this is a chance to turn it around."